Obituary – Severe, Lois Maurine (Magee) « Perry High School Alumni Association, Inc.
﻿- daughter of Mr. and Mrs. A. B. Magee of 701 Kaw street, plans to attend O. C. W. at Chickasha after graduation. Her favorite hobbies are sports, keeping a scrapbook and music. Lois is the outstanding vocalist graduating in this year’s class. She has had honor after honor heaped on her for her ability. She had the leads in the operettas at the high school, she was the lead in the Senior Play, member of the glee club, band, girls’ trio and the girls’ quartet. She was vice president of her junior homeroom, Worthy Advisor of Rainbow Girls, and was featured on many programs. She won excellent rating at the Tonkawa district meet, excellent at the Enid Tri-State Band festival and an excellent plus rating at the state meet at Norman. Her singing is mezzo-soprano. She is a native of Perry. ﻿Lois Severe, 81, of Perry, Oklahoma, was the daughter of A. B. “Burl” and Martha K. (Mugler) Magee. She was born at Perry, Oklahoma on May 26, 1921 and died at Integris Baptist Hospital in Oklahoma City on Friday, April 18, 2003. Memorial services will be at 2:00 p.m. Thursday, April 24, 2003 at the First United Methodist Church in Perry. Rev. Ron Weathers will officiate, assisted by Dr. David Severe. Arrangements are under direction of Brown-Dugger Funeral Home. At the conclusion of the services, the family will receive friends in the church fellowship hall. Memorial contributions may be made to the First United Methodist Church or Oklahoma Medical Research Foundation in care of Brown-Dugger Funeral Home. 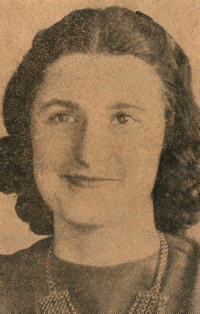 Lois was a graduate of Perry High School. 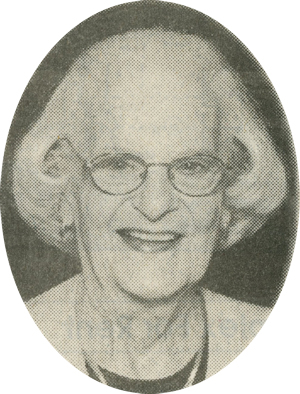 She was a home-maker and an active Member of the First United Methodist Church. She was a 50-year member of the Altar Guild at the church and was a member of the Petunia Garden Club and the Noble County Republican Women. Survivors are one sister, Ginny Clark, and her husband, Harley, Hendersonville, North Carolina; one nephew, Kevin Clark, and his wife, Heidi, Chapel Hill, North Carolina; one niece, Pam Clark, Greensboro, North Carolina; a great-niece, Taylor Parker, Greensboro; and one brother-in-law, Dr. David Severe, and his wife, Paula, Oklahoma City, Oklahoma. Her parents and her husband, Clovis Severe, preceded her in death.